The New Statesman is a British political and cultural magazine published in London. Founded as a weekly review of politics and literature on 12 April 1913, it was connected then with Sidney and Beatrice Webb and other leading members of the socialist Fabian Society, such as George Bernard Shaw who was a founding director. They had supported The New Age , a journal edited by A. R. Orage, but by 1912 that journal moved away editorially from supporting Fabian politics and women's suffrage. 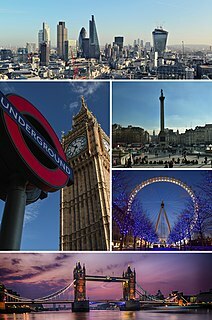 London is the capital and largest city of the United Kingdom. Standing on the River Thames in the south-east of England, at the head of its 50-mile (80 km) estuary leading to the North Sea, London has been a major settlement for two millennia. Londinium was founded by the Romans. The City of London, London's ancient core − an area of just 1.12 square miles (2.9 km2) and colloquially known as the Square Mile − retains boundaries that follow closely its medieval limits. The City of Westminster is also an Inner London borough holding city status. Greater London is governed by the Mayor of London and the London Assembly. Martha Beatrice Webb, Baroness Passfield,, was an English sociologist, economist, socialist, labour historian and social reformer. It was Webb who coined the term "collective bargaining". She was among the founders of the London School of Economics and played a crucial role in forming the Fabian Society. This article gives an overview of liberalism in the United Kingdom. It is limited to liberal parties with substantial support, mainly proved by having had a representation in parliament. The sign ⇒ denotes another party in that scheme. For inclusion in this scheme, it is not necessary that parties labelled themselves as a liberal party. Jason Cowley is an English journalist, magazine editor and writer. After working at the New Statesman, he became the editor of Granta in September 2007, while also remaining a writer on The Observer. He returned to the New Statesman as its editor in September 2008. Circulation was at its highest in the 1960s  [ page needed ] but has surged again in recent years. In 2016, the certified average circulation was 34,025. Traffic to the magazine's website that year reached a new high with 27 million page views and four million unique users. Associated websites are CityMetric, Spotlight and NewStatesman Tech. 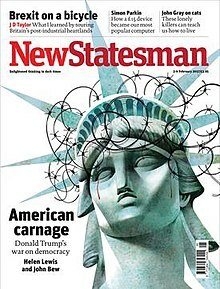 In 2018, New Statesman America was launched. The New Statesman was founded in 1913 by Sidney and Beatrice Webb with the support of George Bernard Shaw and other prominent members of the Fabian Society. The Fabians previously had supported The New Age but that journal by 1912 had moved away from supporting Fabian politics and issues such as women's suffrage. The first editor of the New Statesman was Clifford Sharp, who remained editor until 1928. Desmond MacCarthy joined the paper in 1913 and became literary editor, recruiting Cyril Connolly to the staff in 1928. J.C. Squire edited the magazine when Sharp was on wartime duties during the First World War. George Bernard Shaw, known at his insistence simply as Bernard Shaw, was an Irish playwright, critic, polemicist and political activist. His influence on Western theatre, culture and politics extended from the 1880s to his death and beyond. He wrote more than sixty plays, including major works such as Man and Superman (1902), Pygmalion (1912) and Saint Joan (1923). With a range incorporating both contemporary satire and historical allegory, Shaw became the leading dramatist of his generation, and in 1925 was awarded the Nobel Prize in Literature. The New Age was a British literary magazine, noted for its wide influence under the editorship of A. R. Orage from 1907 to 1922. It began life in 1894 as a publication of the Christian socialist movement; but in 1907 as a radical weekly edited by Joseph Clayton, it was struggling. In May of that year, Alfred Orage and Holbrook Jackson, who had been running the Leeds Arts Club, took over the journal with financial help from George Bernard Shaw. Jackson acted as co-editor only for the first year, after which Orage edited it alone until he sold it in 1922. By that time his interests had moved towards mysticism, and the quality and circulation of the journal had declined. According to a Brown University press release, "The New Age helped to shape modernism in literature and the arts from 1907 to 1922". It ceased publication in 1938. Orage was also associated with The New English Weekly (1932–1949) as editor during its first two years of operation. Women's suffrage is the right of women to vote in elections; a person who advocates the extension of suffrage, particularly to women, is called a suffragist. Limited voting rights were gained by women in Tuscany, Finland, Iceland, Sweden and some Australian colonies and western U.S. states in the late 19th century. National and international organizations formed to coordinate efforts to gain voting rights, especially the International Woman Suffrage Alliance, and also worked for equal civil rights for women. In 1931 the New Statesman merged with the Liberal weekly The Nation and Athenaeum and changed its name to the New Statesman and Nation, which it kept until 1964. The chairman of The Nation and Athenaeum's board was the economist John Maynard Keynes, who came to be an important influence on the newly merged paper, which started with a circulation of just under 13,000. It also absorbed The Week-end Review in 1934 (one element of which survives in the shape of the New Statesman's Weekly Competition, and the other the 'This England' feature). The Competition feature, in which readers submitted jokes and often parodies and pastiches of the work of famous authors, became one of the most famous parts of the magazine. Most famously, Graham Greene won second prize in a challenge to parody his own work. Circulation grew enormously under Martin's editorship, reaching 70,000 by the end of the Second World War. This number helped the magazine become a key player in Labour politics. The paper welcomed Labour's 1945 general election victory but took a critical line on the new government's foreign policy. The young Labour MP Richard Crossman, who had been an assistant editor for the magazine before the war, was Martin's chief lieutenant in this period, and the Statesman published Keep Left , the pamphlet written by Crossman, Michael Foot and Ian Mikardo, that most succinctly laid out the Labour left's proposals for a "third force" foreign policy rather than alliance with the United States. After Johnson's departure in 1970, the Statesman went into a long period of declining circulation under successive editors: Richard Crossman (1970–72), who tried to edit it at the same time as playing a major role in Labour politics; Anthony Howard (1972–78), whose recruits to the paper included Christopher Hitchens, Martin Amis and James Fenton (surprisingly, the arch anti-Socialist Auberon Waugh was writing for the Statesman at this time before returning to The Spectator ); Bruce Page (1978–82), who moved the paper towards specialising in investigative journalism, sacking Arthur Marshall, who had been writing for the Statesman on and off since 1935, as a columnist, allegedly because of the latter's support for Margaret Thatcher; Hugh Stephenson (1982–86), under whom it took a strong position again for unilateral nuclear disarmament; John Lloyd (1986–87), who swung the paper's politics back to the centre; Stuart Weir (1987–90), under whose editorship the Statesman founded the Charter 88 constitutional reform pressure group; and Steve Platt (1990–96). John Kampfner, Wilby's political editor, succeeded him as editor in May 2005 following considerable internal lobbying[ citation needed ]. Under Kampfner's editorship, a relaunch in 2006 initially saw headline circulation climb to over 30,000. However, over 5,000 of these were apparently monitored free copies,  and Kampfner failed to maintain the 30,000 circulation he had pledged. In February 2008, Audit Bureau Circulation figures showed that circulation had plunged nearly 13% in 2007. Kampfner resigned on 13 February 2008, the day before the ABC figures were made public, reportedly due to conflicts with Robinson over the magazine's marketing budget (which Robinson had apparently slashed in reaction to the fall in circulation). In October 2010 the magazine was guest-edited by the British author and broadcaster Melvyn Bragg. The issue included a previously unpublished poem  by Ted Hughes, "Last letter", describing what happened during the three days leading up to the suicide of his first wife, the poet Sylvia Plath. Its first line is: "What happened that night? Your final night. "—and the poem ends with the moment Hughes is informed of his wife's death. In April 2011 the magazine was guest-edited by the human rights activist Jemima Khan. The issue featured a series of exclusives including the actor Hugh Grant's secret recording  of former News of the World journalist Paul McMullan, and a much-commented-on  interview  with Liberal Democrat leader and Deputy Prime Minister Nick Clegg, in which Clegg admitted that he "cries regularly to music" and that his nine-year-old son asked him, "'Why are the students angry with you, Papa?'" In December 2011 the magazine was guest-edited by Richard Dawkins. The issue included the writer Christopher Hitchens's final interview,  conducted by Dawkins in Texas, and pieces by Bill Gates, Sam Harris, Daniel Dennett and Philip Pullman. In October 2012 the magazine was guest-edited by Chinese dissident artist Ai Weiwei  and, for the first time, published simultaneously in Mandarin (in digital form) and English. To evade China's internet censors, the New Statesman uploaded the issue to file-sharing sites such as BitTorrent. As well as writing that week's editorial,  Ai Weiwei interviewed the Chinese civil rights activist Chen Guangcheng,  who fled to the United States after exposing the use of compulsory abortions and sterilisations. The issue was launched on 19 October 2012 at The Lisson Gallery in London,  where speakers including artist Anish Kapoor and lawyer Mark Stephens paid tribute to Ai Weiwei. Tribune is a democratic socialist magazine, founded in 1937 and published in London. It is independent but has usually supported the Labour Party from the left. Publication of the fortnightly print version was suspended in January 2018 for "a short break", continuing online, and it was relaunched as a bimonthly magazine in September 2018. David Morris Aaronovitch is an English journalist, television presenter and author. He is a regular columnist for The Times and the author of Paddling to Jerusalem: An Aquatic Tour of Our Small Country (2000), Voodoo Histories: the role of Conspiracy Theory in Modern History (2009) and Party Animals: My Family and Other Communists (2016). He won the Orwell Prize for political journalism in 2001, and the What the Papers Say "Columnist of the Year" award for 2003. He previously wrote for The Independent and The Guardian. The Sunday Correspondent was a short-lived British weekly national broadsheet newspaper. The newspaper first appeared on 17 September 1989; the title ceased publication with the last issue on 25 November 1990. It was edited by Peter Cole for most of its existence. Cole subsequently went into academia. Anthony Michell Howard, CBE was a British journalist, broadcaster and writer. He was the editor of the New Statesman, The Listener and the deputy editor of The Observer. He selected the passages used in The Crossman Diaries, a book of entries taken from Richard Crossman's The Diaries of a Cabinet Minister. Andrew Philip Drummond-Murray, commonly known as Andrew Murray, is a British campaigner and journalist who was chair of the Stop the War Coalition from its formation in 2001 until June 2011, and again from September 2015 to 2016. Oliver George Kamm is a British journalist and writer who is a leader writer and columnist for The Times. Peter John Wilby is a British journalist. He is a former editor of The Independent on Sunday and the New Statesman. Seumas Milne is a British journalist and political aide. He was appointed the Labour Party's Executive Director of Strategy and Communications in October 2015, under new Labour Leader Jeremy Corbyn, initially on leave from The Guardian. In January 2017 he left the paper to work for the party permanently. ShortList is a free weekly magazine published in London, launched in 2007, the magazine has the biggest circulation of any men's lifestyle magazine in Britain. ShortList is published by Shortlist Media Ltd., who in 2009 launched Stylist, a similar magazine for women. John Lloyd is a journalist, presently contributing editor to the Financial Times, where he has been Labour Editor, Industrial editor, East European Editor, and Moscow Bureau Chief. Francis Beckett is an English author, journalist, biographer, and contemporary historian. He has written biographies of Aneurin Bevan, Clement Attlee, Harold Macmillan, Gordon Brown and Tony Blair. He has also written on education for the New Statesman, The Guardian and The Independent and is the editor of Third Age Matters, the national magazine published by the University of the Third Age. Beckett has been described as "an Old Labour romantic" by Guardian associate editor Michael White. The Broken Compass: How British Politics Lost its Way is the fourth book by British writer Peter Hitchens, published in May 2009. Polemical and partly autobiographical, the book contends that the British political right and left no longer hold firm, adversarial beliefs, but vie for position in the centre, while at the same time overseeing a general decline in British society. Mike Williams is a British journalist and editor, most recently the Editor in Chief of the NME. ↑ "New Statesman". ABC. 14 February 2019. Retrieved 4 March 2019. ↑ "New Statesman | British magazine". Encyclopedia Britannica. Retrieved 2018-09-02. ↑ "About New Statesman". New Statesman. Retrieved 2017-02-13. ↑ Bush, Stephen (2016-11-13). "The Staggers". Newstatesman.com. Retrieved 2016-11-18. ↑ Smith, Adrian (1995). The New Statesman: Portrait of a Political Weekly, 1913-1931. Portland, Oregon: F. Cass. ISBN 9780714641690. ↑ "New Statesman reaching more readers than ever", New Statesman, 12 February 2015. ↑ "Rosy signs for quality journalism market". BBC. 2017-02-08. Retrieved 2017-02-12. ↑ Statesman, New (2016-07-05). "Record traffic for the New Statesman website in June 2016". Newstatesman.com. Retrieved 2016-11-18. ↑ Albeanu, Catalina (18 September 2014). "How data is central to the New Statesman's digital 'spin-offs'" . Retrieved 18 July 2018. ↑ "Launching the New Statesman | From". The Guardian. 2008-04-09. Retrieved 2016-11-18. ↑ "The Project Gutenberg eBook of Current History, The European War Volume I, by The New York Times Company". ↑ "The Project Gutenberg eBook of Current History, The European War Volume I, by The New York Times Company". Gutenberg.org. Retrieved 2016-11-18. ↑ Smith, Adrian (3 April 2013). "The secret life of Clifford Sharp". New Statesman. Retrieved 12 Nov 2018. ↑ "A competition!". The Economist. Retrieved 6 February 2017. ↑ Morris, Benny (1991). The Roots of Appeasement: The British Weekly Press and Nazi Germany During the 1930s (1st ed.). London: Frank Cass. pp. 26, 65, 73, 118, 134, 156, 178. ISBN 9780714634173. ↑ The Anti-Appeasers (Oxford: Oxford University Press, 1971), pp. 156–157. 1 2 3 4 Beasley, Rebecca; Bullock, Philip Ross (2013). Russia in Britain, 1880-1940: From Melodrama to Modernism (1st ed.). Oxford: Oxford University Press. pp. 209–224. ISBN 0199660867. ↑ Wright, Patrick (2007). Iron Curtain: From Stage to Cold War. Oxford University Press. p. 226. ISBN 978-0199231508. ↑ Jones, Bill (1977). The Russia Complex: The British Labour Party and the Soviet Union. Manchester [Eng. ]: Manchester University Press. p. 25. ISBN 9780719006968. ↑ Abu-Manneh, Bashir (2011). Fiction of the New Statesman, 1913-1939. Newark: University of Delaware Press. pp. 169–170. ISBN 1611493528. ↑ Moorhouse, Roger (2014). The Devils' Alliance: Hitler's Pact with Stalin, 1939-1941. Random House. p. cxxxviii. ISBN 1448104718. ↑ Corthorn, Paul (2006). In the Shadow of the Dictators: The British Left in the 1930s. London [u.a. ]: Tauris Academic Studies. p. 215. ISBN 1850438439. ↑ "British Premier Is Suing Two Magazines for Libel". NYTimes.com. 1993-01-29. Retrieved 2016-11-18. ↑ Steve Platt, Fisk. "Sue, grab it and run the country: The Major libel case was a farce with a darker side, says Steve Platt, editor of the New Statesman". The Independent. Retrieved 2016-11-18. ↑ "Major faces legal action over affair". BBC News. 2002-09-29. Retrieved 2016-11-18. ↑ The journal of intelligence history. International Intelligence History Association, p. 63. ↑ Dettmer, Jamie (12 February 1995). "Spies, in from the cold, snitch on collaborators". Insight on the News. Archived from the original on 9 March 2012. Retrieved 3 June 2012. ↑ "New Statesman | Media". the Guardian. Retrieved 2018-09-02. 1 2 Peter Wilby (12 September 2005). "Statesman-like regrets". The Guardian. Retrieved 16 February 2017. ↑ Sewell, Dennis (14 January 2002). "A Kosher Conspiracy?". New Statesman. Retrieved 26 August 2009 . 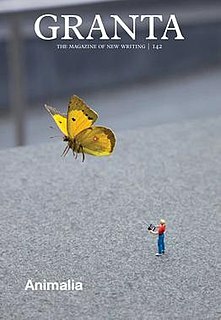 ↑ Image of New Statesman Cover from Wikimedia Commons. ↑ Wilby, Peter (11 February 2002). "The New Statesman and anti-Semitism". New Statesman. Retrieved 26 August 2009 . ↑ Wilby, Peter (18 February 2008). "The Statesman staggers on". The Guardian. London. ↑ Tryhorn, Chris (14 February 2008). "New Statesman sales plummet". The Guardian. London. ↑ James Robinson. "Mike Danson takes full ownership of New Statesman | Media". The Guardian. Retrieved 2016-11-18. ↑ Brook, Stephen. "Jason Cowley named as New Statesman editor | Media". The Guardian. Retrieved 2016-11-18. ↑ Owen Amos "New Statesman management to discuss NUJ recognition", Archived 16 June 2011 at the Wayback Machine UK Press Gazette, 16 January 2009. Retrieved 4 February 2009. ↑ Sweney, Mark. "Morgan Rees of Men's Health named editors' editor at BSME awards | Media". The Guardian. Retrieved 18 November 2016. ↑ By admin Twitter (16 April 2012). "PPA Awards 2012: The shortlist – Press Gazette". Blogs.pressgazette.co.uk. Retrieved 18 November 2016. ↑ "Jason Cowley | NOMINEE OF THE ’13 Distinguished award" Archived 15 February 2017 at the Wayback Machine , European Press Prize. ↑ Burrell, Ian (23 February 2017). "New Statesman editor Jason Cowley on shaking off its 'house journal of the Labour Party' image". The Drum. Retrieved 11 June 2017. 1 2 "New Statesman wins Current Affairs Magazine and Launch of the Year at BSME Awards". New Statesman. 22 November 2017. Retrieved 15 December 2017. ↑ Moore, Suzanne (2009-03-24). "SUZANNE MOORE: I had to resign from the New Statesman when I saw what Alastair Campbell did to it". Daily Mail Online. Retrieved 2016-11-18. ↑ Owen Bowcott (2009-03-23). "Knives out at New Statesman as Alastair Campbell editing stint sparks 'crisis of faith' | Media". The Guardian. Retrieved 2016-11-18. ↑ Brook, Stephen (2009-09-15). "Ken Livingstone is New Statesman guest editor | Media". The Guardian. Retrieved 2016-11-18. ↑ Kennedy, Maev (2010-10-06). "Unknown poem reveals Ted Hughes' torment over death of Sylvia Plath | Books". The Guardian. Retrieved 2016-11-18. ↑ Addley, Esther (2011-04-06). "Phone hacking: Hugh Grant taped former NoW journalist | Media". The Guardian. Retrieved 2016-11-18. ↑ "Nick Clegg, you chose to be coalition arm-candy, so accept being a punchbag | Simon Jenkins | Opinion". The Guardian. 2011-04-07. Retrieved 2016-11-18. ↑ Phillipson, Bridget (2011-04-07). "Jemima Khan meets Nick Clegg: 'I'm not a punchbag – I have feelings'". Newstatesman.com. Retrieved 2016-11-18. ↑ Reeves, Rachel (2011-12-13). "Preview: Richard Dawkins interviews Christopher Hitchens". Newstatesman.com. Retrieved 2016-11-18. ↑ Statesman, New (2012-10-07). "Ai Weiwei to guest-edit the New Statesman". Newstatesman.com. Retrieved 2016-11-18. ↑ Weiwei, Ai (2012-10-17). "To move on from oppression, China must recognise itself". Newstatesman.com. Retrieved 2016-11-18. ↑ Weiwei, Ai (2012-10-17). "Chen Guangcheng: "Facts have blood as evidence"". Newstatesman.com. Retrieved 2016-11-18. ↑ Reeves, Rachel (2012-10-19). "In pictures: Ai Weiwei launch party". Newstatesman.com. Retrieved 2016-11-18. ↑ Reeves, Rachel (2013-10-25). "In this week's New Statesman: Russell Brand guest edit". Newstatesman.com. Retrieved 2016-11-18. ↑ Brand, Russell (24 October 2013). "Russell Brand on revolution: "We no longer have the luxury of tradition"". The New Statesman. Retrieved 2013-10-25.